John Svenson, a sculptor who lived in San Antonio Heights and often bedeviled the Upland City Council, died in April. A memorial service Sunday at Upland’s Cooper Museum was the scene of laughter and stories. I was there, knew Svenson and pay tribute in Wednesday’s column. Books read: “The Autobiography of Mark Twain,” Charles Neider, ed. 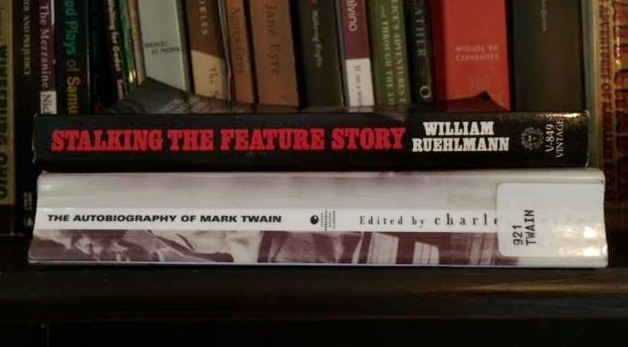 ; “Stalking the Feature Story,” William Ruehlmann. First off, sorry for the slight delay this month in writing and posting this; the holiday put me behind, as did a brief illness. Hope you haven’t forgotten what you read in May. It was another two-book month for me, both of them nonfiction. One is a handbook from 1979 on reporting; the other is the 1959 edition of Twain’s autobiography. “Stalking” wasn’t bad despite being pre-Internet. I don’t know that I learned a lot from it at this stage in my career, but the story examples were worth reading and the admonition to pay close attention to details, no matter how minor, is worth heeding. (See what I did there?) I bought the book in Portland in 2010 at Cameron’s, one of the “other” used bookstores in the town dominated by Powell’s. In part, it was a pity purchase, but it did seem potentially useful. Twain’s book was bought circa 1985 at my college bookstore, I think for pleasure rather than a class. All I’d ever read from it is the last chapter, to which I must have been directed somewhere along the way; it’s about the death of one of his daughters and was written just months before his own death. There are multiple editions of the mass of writing and dictation known as the Autobiography, all compiled after Twain’s death in 1910. Neider’s was the third and was considered definitive, I think, until the whole thing was published in three volumes the past few years, to great acclaim, in part due to the sections suppressed earlier. I suspect many who bought the books, which collectively run about 2,500 pages with notes, never bothered reading much of them. They certainly intimidate me. Neider’s 500-page edition seems like a sensible version in which the material is organized chronologically and, at least as he tells it, material which is nothing more than newspaper clippings with Twain’s commentary was left out. He laments that several days’ dictations on the subject of religion weren’t available at Twain’s surviving daughter’s request. What’s left is somewhat unsatisfying as autobiographies go, as Twain didn’t write about a lot of stuff you’d wish he’d write about, such as writing “Huck Finn,” or famous people he met (other than Bret Harte and Robert Louis Stevenson). Instead, he writes at length about his childhood, which was fun to read, and about his family. There’s also an extended section about General Grant, whose memoirs Twain published. Twain is not one to let the facts get in the way of a good story, but with stories this good, who cares? This was a highly enjoyable book, often hilarious, and surprisingly often will move you to tears, especially regarding the deaths of his wife and two of his daughters, sections in which his grief, still fresh as he wrote, spans the years to strike home. Flawed as the book is, he comes across as a three-dimensional figure, sometimes bumbling and foolish, unable to understand business matters or things that are clear to his young daughter, and of course witty and perceptive. I started reading my original copy, the brittle cover of which began to loosen about 60 pages in; at that point, rather than destroy it, I checked out a more modern, easier to read version from the Rancho Cucamonga Public Library. That’s what’s in the photo. Those were my two books. How was your May — if you recall? Next month: ehh, probably two more books, one of which is 550 pages. 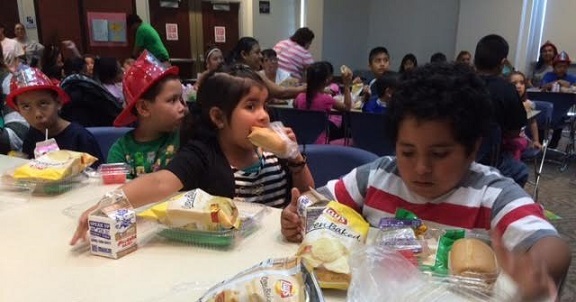 They’re giving kids free lunches this summer at the Ontario City Library, courtesy of the school district and the USDA, which is funding it. More than 200 kids showed up for Wednesday’s kickoff. I write about the unusual program in my Sunday column. Friday’s column is shorter than usual, for good or bad: I wrote up a bunch of items but had to go home sick before I could come up with a topper. But, since they mostly couldn’t wait, and the show must go on, you get eight brief items and nothing else. I’m writing this Friday morning from my desk, a sign I’ve recovered enough to get back to work. Onward to Sunday’s column! I’d seen the sign on this downtown Ontario storefront for weeks and puzzled over the name, which was probably not tested with a focus group. Evidently the crust is made with nothing but yeast, flour and water. But I was curious about the place, downtown being light on restaurants. After my movie night at the library one evening, two friends suggested we try it out. One had been there twice and liked it. 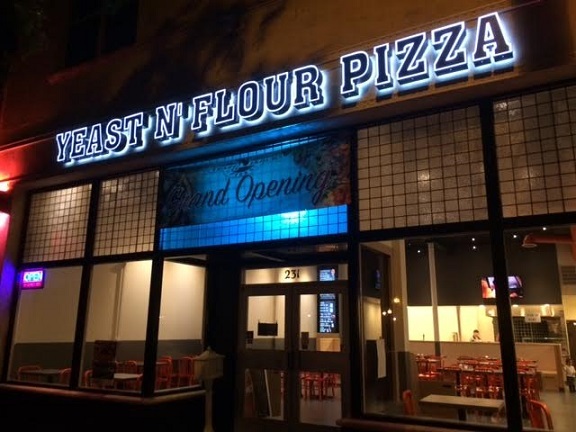 Yeast N’ Flour is a fast-fired pizzeria, but not a chain. They also have wings, subs and a couple of salads. Of course we went for the individual pizzas ($8.19). 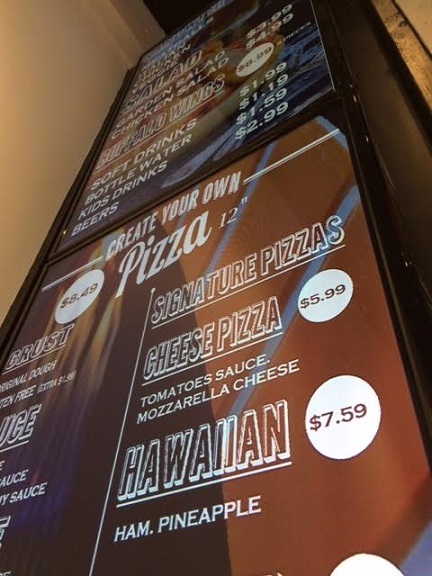 You can choose your crust (original, gluten-free), sauce (red, spicy red, white) and cheese (mozzarella, gorgonzola, parmesan, ovalini), and then can choose from an array of toppings. 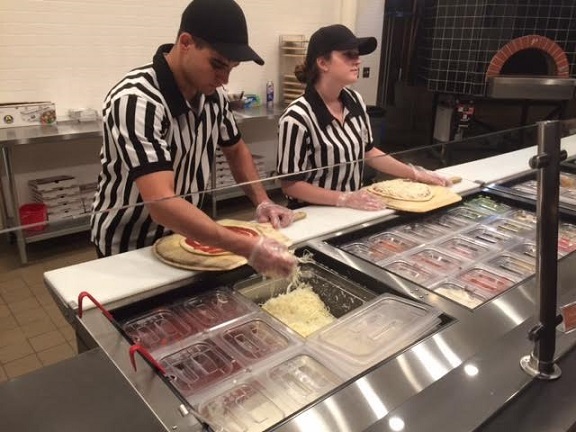 Employees all dress in referee-type uniforms. They make the pizza in front of you and then shove it in a gas oven. You pay and they bring it to your table in about five minutes. The interior has high ceilings and an industrial chic look. There are a few TVs, but not a lot. The walls are otherwise bare and the atmosphere doesn’t quite match the referee look. The pizza was very good. 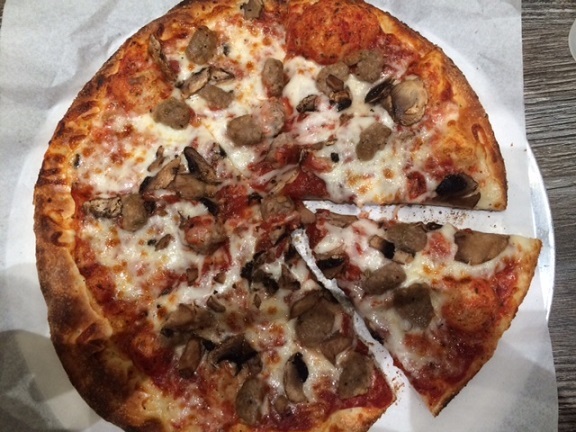 The crust was particularly fine, with a crispness and char that you get at real pizzerias but rarely at fast-fired places. I’m surprised myself to say that I liked this pizza better than Blaze and Pieology. I ate half and took the rest home. The other newcomer liked his pie. 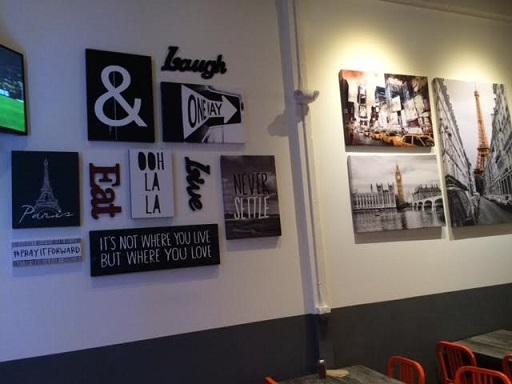 He thought the interior was too stark and said the menu board is placed too high on the wall for comfort. The veteran said she’s glad to see a pizzeria downtown. She’s had the white sauce, which she said was ranch-y, and the spicy red, which is garlicky. One further burst of nit-picking: the spelling. 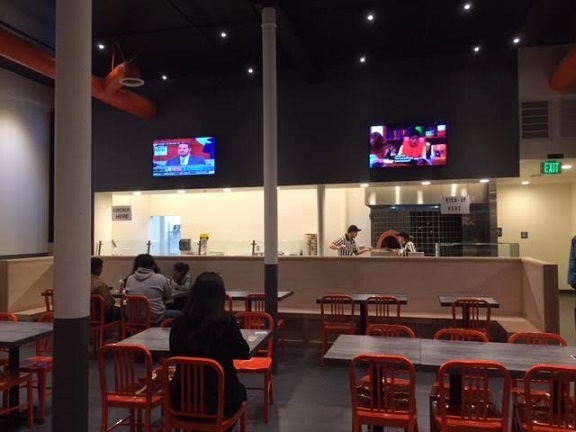 The menu has “gorgonzalo,” “oergano” and “pepperonie,” A promotional card at the register gave the location as “downtwon” Ontario. It wasn’t until writing this that I noticed my receipt, on which I’d scribbled notes, spells the restaurant as “Yeast N’ Falour.” I don’t know if this is inattention or a language difficulty, but it’s the sort of thing that erodes confidence that a business knows what it’s doing. Update July 2016: I’ve gone back a couple of times, and not only is the food still good, they’ve got some actual decor in now. 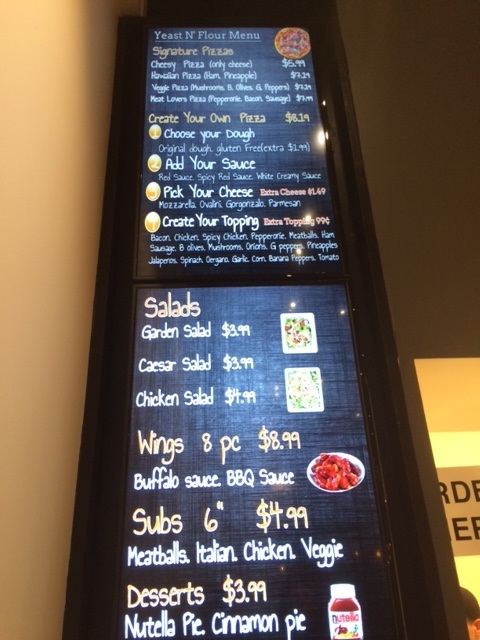 And the menu board has been replaced. It’s not perfect (“tomatoes sauce”), but it’s a vast improvement. The family, by the way, is Egyptian, and nice. On Sunday, I got to co-interview Billy Dee Williams onstage at Rancho Cucamonga’s Lewis Family Playhouse about his career as part of the library’s Star Wars Reads weekend of events. It was occasionally revealing, and occasionally tense. Read about it in my Wednesday column.